My friend Heather lives in beautiful Montana. I love stalking her on Instagram because she posts amazing photos of the land she lives on; her cute, fluffy doggie; knitted caps and sweaters she just seems to whip up; her adorable baby boy, and lately she's been tempting me with food. Gurrrl, I need to live next door to you! Of course she also has a cool blog with a cool name, Cooking All The Thyme, where you can enjoy more of her recipes and beautiful creations (seriously, you're gonna die over the knitted baby stuff). Basically, she is awesome, even more so that she agreed to guest post her Chicken Tortilla Soup after I drooled over her photo and asked her to do so. Thank you Instagram and thank you Heather! During the fall and winter months you can often find me cooking up big pots of soup or stew. I think it’s one of the best ways to enjoy, or sometimes just help tolerate, the cold, rain, and snow. I always like to make a big pot and have dinner made for a few nights, and maybe freeze some for later too. My hubby and I recently made my Chicken Tortilla Soup, and it was so good that right after it was gone we cooked up another pot of it. Missy spotted my food pics of it on Instagram and let me know it was soup and stew month and invited me to guest post. I’m delighted! 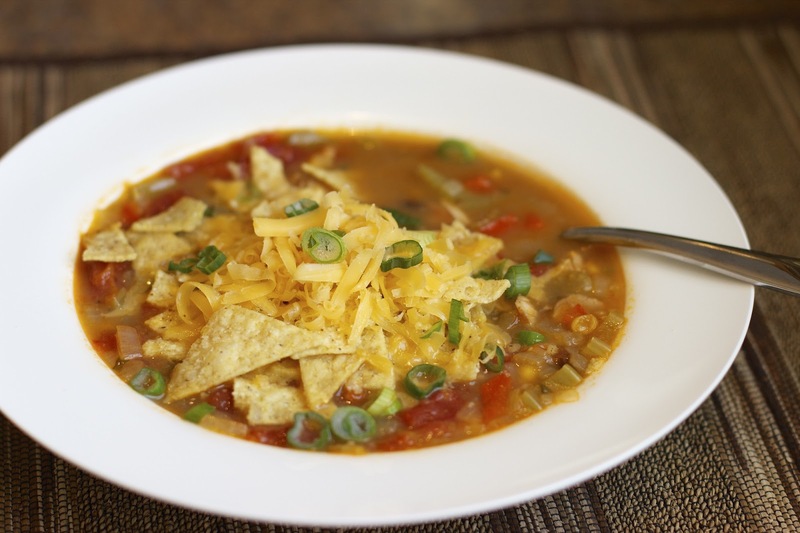 This Chicken Tortilla Soup is one of my top favorites. But then I think I say that about every soup or stew, there are way too many favorites! I made this a couple years ago, after just writing a list of ingredients that I knew I wanted to use and decided on the order of how I wanted to layer in the flavors. It turned out awesome so I put it on my (much neglected since having a baby) blog, Cooking all the Thyme. This time I made it the same as it’s written on there except with a little more southwestern style, adding red bell pepper, black beans, and corn. I love that you can get creative with different vegetables and things you want to add in. Give it a little kick with some jalapeno or leave it out and have it mild. I also love that there’s not a lot of prepping since most of what you need is canned or frozen, so it is quick and easy to put together. Always nice when you don’t have to be a human food processor for an hour before cooking! Garnish it with the tortilla chips, cheddar, and scallions if so desired, and you feel like you’re having a big Mexican night kind of dinner but on the lighter side. It’s flavorful and heartwarming, and like all soups I think, even better on the second or third day after all the flavors marry. Enjoy! If chicken is not cooked yet, cut about 1 lb chicken breasts into bite size pieces, heat olive oil in large soup pot and sauté chicken just until cooked. Set aside in a bowl and return empty pot to stove.] Cover the bottom of the large soup pot with olive oil and heat over med.-high. Sauté onion until translucent but not brown, add in garlic and jalapeño and cook for a couple minutes, then add celery and red pepper to sauté another 4-5 minutes. Stir in cooked chicken, cumin, chili powder, pinch of kosher salt and pepper, and dried parsley if you don’t have fresh, stir it all up. Sprinkle the flour onto the mixture, stir and cook for 3-5 minutes to cook out the raw flour taste. Pour in diced tomatoes, enchilada sauce, and 3-4 qts. chicken/vegetable stock, stir and let it heat up to a simmer. Stir in the beans (drained and rinsed), diced green chilies, and frozen corn. If using fresh herbs, add them in and salt and pepper to taste. Let simmer (not boil!) for about a half an hour, if you can wait that long. Dish up into bowls and sprinkle with crushed tortilla chips, cheese, and scallions. Enjoy! wow, yummy yummy!!! That looks super duper delicious. Lol, Missy that would be awesome if you lived next door, move over anytime! :) Thanks for the invite to post! If anyone makes the soup, let me know how you like it! I commented below but saw I could comment directly to you. Made it tonight- great recipe! I want to reach in and grab that spoon for a bite! That sounds really delicious! I will have to put this on my meal plan for next week! Jenny D - please keep your weekly meal plans so when I'm back to (errr, start) meal planning, I can get some inspiration from you! Thanks, Heather - love your blog and this recipe sounds incredible! I love chicken tortilla soup and agree, anytime you can make a big pot and eat from it for a few nights is a success!